गेमेलान धागु छगु कथंयागु इन्डोनेसियाली सांगीतिक परम्परा खः। थुकिलि मेटालोफोन, जाइलोफोन, ड्रम, गंग, पंयागु बांसुरी, तार बाजं व मेहालिम्ह थें न्यागु चीजत दै। A gamelan as a set of instruments is a distinct entity, built and tuned to stay together — instruments from different gamelan are not interchangeable. The word "gamelan" comes from the Javanese word "gamel", meaning to strike or hammer, and the Malay-Indonesian suffix "an" makes the root a collective noun. Gamelan are found in the Indonesian islands of Java, Madura, Bali, and Lombok (and other Sunda Islands), in a wide variety of ensemble sizes and formations. In Bali and Lombok today, and in Java through the 18th century, the term "gong" has been preferred to or synonymous with gamelan. Traditions of gamelan-like ensembles (sometimes called "gong-chime ensembles" by ethnomusicologists) also exist in the Philippines, Malaysia and Suriname, sometimes due to emigration, trade, or diplomacy. More recently, through immigration and local enthusiasm, gamelan ensembles have become active throughout Europe, The Americas, Asia, and Australia. Javanese gongs at the Indonesian Embassy in Canberra. Metals used include bronze, brass, and iron, with a 10:3 copper-to-tin bronze alloy usually considered the best material. In addition, there are gamelan ensembles composed entirely of bamboo-keyed instruments, of bamboo flutes, of zithers, or of unaccompanied voices with the functions of metallophones or gongs in the metal ensemble transferred to surrogates. There are many ways to look at the musical structure of gamelan music. One is to consider three layers: a fixed melodic outline, with punctuated by lower pitched instruments and decorated by higher pitched instruments. A Javanese classification also adds a leader of the melody and a leader of time. Many of the music forms will be marked at the end by the largest gong in the ensemble, although there are some exceptions. Playing gamelan instruments - Bpk. Soegito at the Indonesian Embassy in Canberra. Gamelan is often used to accompany dance, wayang puppet performances, and rituals. Some performances are associated with royalty, such as visits by the sultan of Yogyakarta. Certain gamelans are associated with rituals, such as the Gamelan Sekaten, which is used in celebration of Mawlid an-Nabi (Muhammad's birthday). In Bali, almost all religious rituals include gamelan performance. In the West, gamelan is often performed in a concert context, but may also incorporate dance or wayang. Celempung - Indonesian Embassy in Canberra. The tuning and construction of a gamelan orchestra is a complex process. Javanese gamelans use two tuning systems: sléndro and pélog. There are other tuning systems such as degung (exclusive to Sunda, or West Java), and madenda (also known as diatonis, similar to a European natural minor scale). In central Javanese gamelan, sléndro is a system with five notes to the diapason (octave), fairly evenly spaced, while pélog has seven notes to the octave, with uneven intervals, usually played in five note subsets of the seven-tone collection. This results in sound quite different from music played in a western tuning system. Many gamelan orchestras will include instruments in each tuning, but each individual instrument will only be able to play notes in one. The precise tuning used differs from ensemble to ensemble, and give each ensemble its own particular flavour. Colin McPhee (1966) remarks, "Deviations in what is considered the same scale are so large that one might with reason state that there are as many scales as there are gamelans." However, this is a view that is contested by some teachers of gamelan, and there have been efforts to combine multiple ensembles and tuning structures into one gamelan so as to ease transportation issues at the times of festivals. 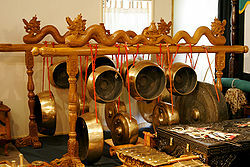 One such ensemble is gamelan Manikasanti, which can play the repertoire of many different ensembles. A peculiarity of gamelans is that, although the intervals between notes in a scale are very close to identical for different instruments within each gamelan, the intervals vary from one gamelan to the next. The occasion for the word approximately is that it is common in Balinese gamelan that instruments are played in pairs which are tuned slightly apart so as to produce interference beating which are ideally at a consistent speed for all pairs of notes in all registers. It is thought that this contributes to the very "busy" and "shimmering" sound of gamelan ensembles. In the religious ceremonies that contain Gamelan, these interference beats are meant to give the listener a feeling of a god's presence or a stepping stone to a meditative state. The gamelan has been appreciated by several western composers of classical music, most famously Claude Debussy who heard a Javanese gamelan play at the Paris Exposition of 1889 (World's Fair). (The gamelan Debussy heard was in the near-diatonic madenda scale and was played by Sundanese musicians.) Despite his enthusiasm, direct citations of gamelan scales, melodies, rhythms, or ensemble textures have not been located in any of Debussy's own compositions. However, the equal-tempered pentatonic scale appears in his music of this time and afterward, and a Javanese gamelan-like heterophonic texture is emulated on occasion, particularly in "Pagodes," from Estampes (solo piano, 1903), in which the great gong's cyclic punctuation is symbolized by a prominent perfect fifth. Direct homages to gamelan music are to be found in works for western instruments by Béla Bartók, Francis Poulenc, Olivier Messiaen, Colin McPhee, Benjamin Britten and Steve Reich. In more recent times, American composers such as Barbara Benary, Lou Harrison, Dennis Murphy, Michael Tenzer, Evan Ziporyn, Daniel James Wolf and Jody Diamond as well as Australian composers such as Peter Sculthorpe, Andrew Schultz and Ross Edwards have written several works with parts for gamelan instruments or full gamelan ensembles. I Nyoman Windha is among contemporary Indonesian composers that have written compositions using western instruments along with Gamelan. American folk guitarist John Fahey included elements of gamelan in many of his late-60s sound collages, and again in his 1997 collaboration with Cul de Sac, The Epiphany of Glenn Jones. The experimental art-rock band King Crimson, while not using Gamelan instruments, used interlocking rhythmic paired guitars that were influenced by Gamelan. Experimental pop groups His Name is Alive and Xiu Xiu use Gamelan percussion in many songs. The avant-garde group The Residents have also used gamelan in their music, particularly in their 1976 album Fingerprince. Many Americans were first introduced to the sounds of gamelan by the popular anime film Akira. Gamelan elements are used in this film to punctuate several exciting fight scenes, as well as to symbolize the emerging psychic powers of the tragic hero, Tetsuo. The gamelan in the film's score was performed by the members of the Japanese musical collective Geinoh Yamashirogumi. Gamelan and kecak are also used in the soundtrack to the video game Secret of Mana. Balinese Music (1991) by Michael Tenzer, ISBN 0-945971-30-3. Included is an excellent sampler CD of Balinese Music. Gamelan Gong Kebyar: The Art of Twentieth-Century Balinese Music (2000) by Michael Tenzer, ISBN 0-226-79281-1 and ISBN 0-226-79283-8. Music in Bali (1966) by Colin McPhee. New Haven, CT: Yale University Press. Music in Java: History Its Theory and Its Technique (1949) edited by Jaap Kunst, ISBN 90-247-1519-9. An appendix of this book includes some statistical data on intervals in scales used by gamelans. Introduction to Gamelan Music by Qehn, Javanese only. Another virtual gamelan. Allows to play, and "program" (sequencer like) gamelans. Text is in French. This page was last edited on ३ जुलाई २०१४, at ०५:४६.